We manufacture superior quality Musical Flasher that offer high durability and reliability. These Musical Flasher are made up of high quality raw material and are widely used in the Indian automobile industry. Our in house design unit enables us to customize these Musical Flasher according to the specific requirements of the clients. - Accurate 85 cycles per minute flash rate with minor variations. We are a most trusted name among the topmost companies in this business, involved in offering 12V Musical Flasher. Being a foremost organization in the industry, we are actively engaged in offering the best quality range of Automotive Musical Flasher. 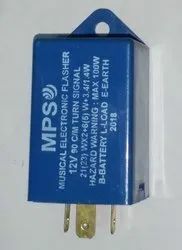 Flasher is made using Mahindra relay. Also available in 24V. 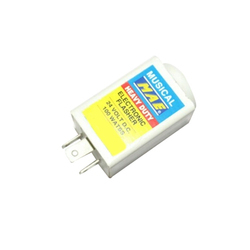 We have marked a remarkable position in the market by offering the best quality array of Musical Flasher. Made with the durable quality material, this Musical Flusher is suitable to be used in two wheelers.Musical Flusher is suitable to be used in two wheelers.